, a French lady of fashion, remarkable for simplicity of heart, and regularity of manners, but of an enthusiastic and unsettled temper, was descended of a noble family, and born atMontargis, April 13, 1648. At the age of seven she was sent to the convent of the Ursulines, where one of her sisters by half-blood took care of her. She had afforded proofs of an enthusiastic species of devotion from her | earliest infancy, and bad made so great a progress in what her biographers call “the spiritual course” at eight years of age, as surprized the confessor of the queen mother of England, widow of Charles I. who presented her to that princess, by whom she would have been retained, had not her parents opposed it, and sent her back to the Ursulines. She wished then to take the habit; but they having promised her to a gentleman in the country, obliged her to marry him. At twenty-eight years of age she became a widow, being left with two infant sons and a daughter, of whom she was constituted guardian; and their education, with the management of her fortune, became her only employment. She had put her domestic affairs into such order, as shewed an uncommon capacity; when of a sudden she was struck with an impulse to abandon every worldly care, and give herself up to serious meditation, in which she thought the whole of religion was comprised. 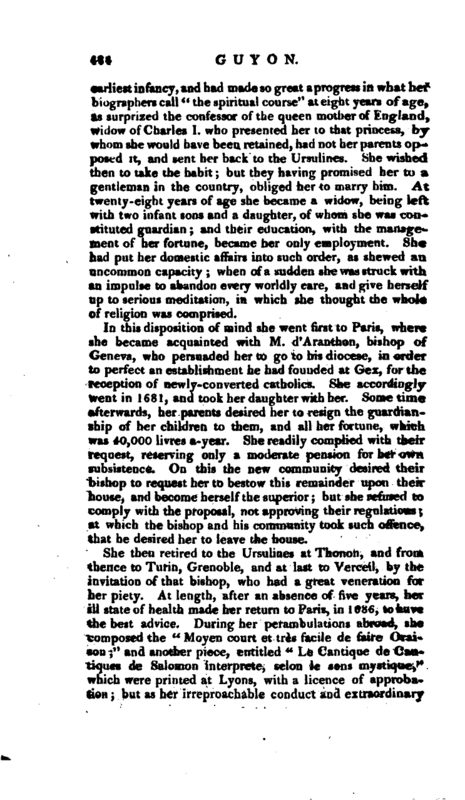 In this disposition of mind she went first to Paris, where she became acquainted with M. d’Aranthon, bishop of Geneva, who persuaded her to go to his diocese, in order to perfect an establishment he had founded at Gex, for the reception of newly-converted catholics. She accordingly Went in 1681, and took her daughter with her. Some time afterwards, her parents desired her to resign the guardianship of her children to them, and all her fortune, which was 40,000 livres a-year. She readily complied with their request, reserving only a moderate pension for her own subsistence. On this the new community desired their bishop to request her to bestow this remainder upon their house, and become herself the superior; but she refused to comply with the proposal, not approving th^ir regulations; at which the bishop and his community took such offence, that he desired her to leave the house. She then retired to the Ursulines at Thonon, and from thence to Turin, Grenoble, and at last to Verceil, by the invitation of that bishop, who had a great veneration for her piety. At length, after an absence of five years, her ill state of health made her return to Paris, in 1686, to have the best advice. 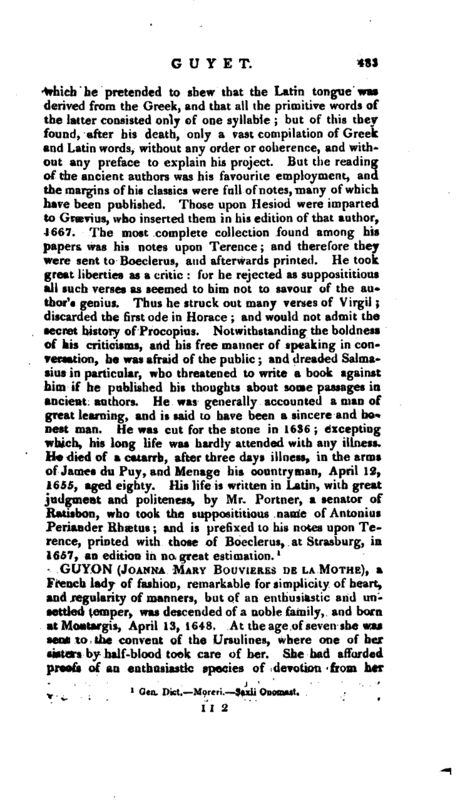 During her perambulations abroad, she composed the “Moyen court et tres facile de faire Oraison;” and another piece, entitled “Le Cantique tie Cantiques tie Salomon interprete, selon le sens mystique,” which were printed at Lyons, with a licence of approbation; but as her irreproachable conduct and extraordinary | virtues made many converts to her system, which was culled Quietism, she was confined, by an order from the king, in the convent des Filles de la Visitation, in 1688. Here she was strictly examined for the space of eight months, by order of M. Harlai, archbishop of Paris; but this served only to establish her innocence and virtue; and madame Miraniou, the superior of the convent, representing the injustice of her detention to madame Maintenon, the latter pleaded her cause so effectually to the king, that she obtained her discharge, and afterwards conceived a particular affection and esteem for her. Not long after her deliverance, she was introduced to Fenelon, afterwards archbishop of Cambray, who became her disciple. She had besides acquaintance with the dukes de Chevreuse and Beauvilliers, and several other distinguished persons, who, however, could not protect her from the ecclesiastics, who made violent outcries on the danger of the church from her sect. In this exigence, she was persuaded to put her writings into the hands of the celebrated Bossuet, bishop of Meaux, and submit them to his judgment; who, after reading all her papers, both printed and Mss. including a life she had written of herself, had a conference with her, and was well satisfied with her principles; but her enemies among the churchmen bt-ing not equally satisfied, an order passed for the re-examination of her two books already mentioned. Bossuet was at the head of this examination, to whom the bishop of Chalons, afterwards cardinal de Noailles, was joined, at the request of madame Guyon; and to these two were added, M.Tronson, superior of the society of St. Sulpice, and Fenelon. 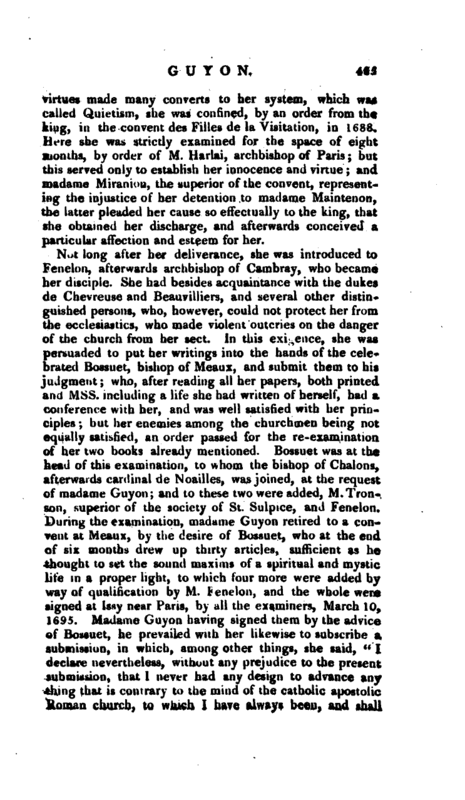 During the examination, madame Guyon retired to a convent at Meaux, by the desire of Bossuet, who at the end of six months drew up thirty articles, sufficient as he thought to set the sound maxims of a spiritual and mystic life in a proper light, to which four more were added by way of qualification by M. Fenelon, and the whole were signed at Issy near Paris, by all the examiners, March 10, 1695. 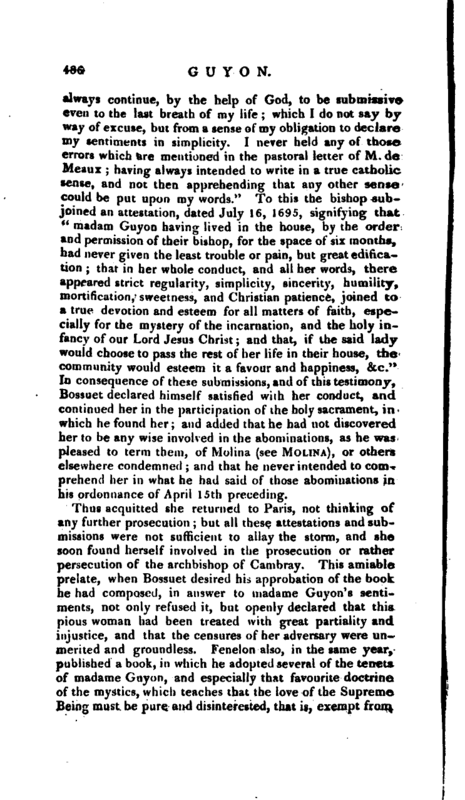 Madame Guyon having signed them by the advice of Bossuet, he prevailed with her likewise to subscribe a submission, in which, among other things, she said, “I declare nevertheless, without any prejudice to the present submission, that I never had any design to advance any thinw that is contrary to the mind of the catholic apostolic Iloman church, to which I have always been, and shall | always continue, by the help of God, to be submissive even to the last breath of my life; which I do not say by way of excuse, but from a sense of my obligation to declare my sentiments in simplicity. I never held any of those errors which are mentioned in the pastoral letter of M. de Meaux; having always intended to write in a true catholic sense, and not then apprehending that any other sense could be put upon my words.” To this the bishop subjoined an attestation, dated July 16, 1695, signifying that “madam Guyon having lived in the house, by the order and permission of their bishop, for the space of six months, had never given the least trouble or pain, but great edification; that in her whole conduct, and all her words, there appeared strict regularity, simplicity, sincerity, humility, mortification, sweetness, and Christian patience, joined to a true devotion and esteem for all matters of faith, especially for the mystery of the incarnation, and the holy infancy of our Lord Jesus Christ; and that, if the said lady would choose to pass the rest of her life in their house, the community would esteem it a favour and happiness, &c.” In consequence of these submissions, and of this testimony, Bossuet declared himself satisfied with her conduct, and continued her in the participation of the holy sacrament, in which he found her; and added that he had not discovered her to be any wise involved in the abominations, as he was pleased to term them, of Molina (see Molina), or others elsewhere condemned; and that he never intended to comprehend her in what he had said of those abominations in his ordonnance of April 15th preceding. Thus acquitted she returned to Paris, not thinking of any further prosecution. ; but all these attestations and submissions were not sufficient to allay the storm, and she soon found herself involved in the prosecution or rather persecution of the archbishop of Cambray. This amiable prelate, when Bossuet desired his approbation of the book he had composed, in answer to madame Guyon’s sentiments, not only refused it, but openly declared that this pious woman had been treated with great partiality and injustice, and that the censures of her adversary were unmerited and groundless. Fenelon also, in the same year, published a book, in which he adopted several of the tenets of madame Guyon, and especially that favourite doctrine of the mystics, which teaches that the love of the Supreme Being must be pure and disinterested, that is, exempt from | all views of interest and all hope of reward. What followed with respect to the archbishop may be seen in another place (art. Fenelon); but madame Guyon was imprisoned before the expiration of 1695, in the castle of Vincennes, whence she was removed to a convent, and afterwards sent to the Bastille, where she underwent many rigorous examinations, and continued in prison as a criminal till the meeting of the general assembly of the clergy of France in 1700, when nothing being proved against her, she was released. After this she went first to the castle belonging to her children, whence she was permitted to retire to Blois, the next town to that castle. From this time till her death, which was twelve years, she remained in perfect oblivion, and her uniform and retired life is an evident proof, that the noise she had made in the world, proceeded not from any ambition she had of making a figure in it: her whole time being employed in the contemplation of God. 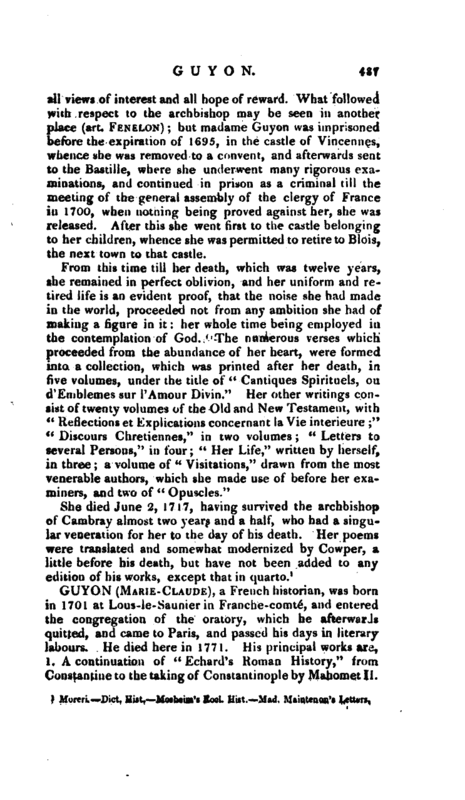 The numerous verses which proceeded from the abundance of her heart, were formed into a collection, which was printed after her death, in five volumes, under the title of “Cantiques Spirituels, ou d‘Emblemes sur l’Amour Divin.” Her other writings consist of twenty volumes of the Old and New Testament, with “Reflections et Explications concernant la Vie imerieure” f< Discours Chretiennes,“in two volumes” Letters to several Persons,“in four” Her Life,“written by herself, in three a volume of” Visitations,“drawn from the most venerable authors, which she made use of before her examiners, and two of” Opuscles." 1 Moreri. —Dict. Hist. Mosheim’s Eccl. Hist. Mad. Maiateuoft’s Letters.